Growing up in the Seattle area you take a few things for granted - the incredible sushi, the lack of a need to wear sunscreen, and teriyaki joints on every corner. You might say that teriyaki shops are like barbecue shacks in the south, they are everywhere and you can get a decent meal at any of them (even if you have just one you're loyal to). Typically you get a few pieces of slightly charred crispy, teriyaki sauce glazed chicken thighs over white rice with a small iceberg salad. Simple food at its finest. I finally dusted off the grill this week (I know - its already the middle of July), which I think might be just the thing for perfecting the teriyaki joint style chicken, but ribs were crazy on sale post 4th of July - so I gave both spare ribs and baby backs a lick with my now-go-to teriyaki sauce. The spareribs won by a long shot for me - I think they're fatter nature made kept them juicer and gave more room for saucing. Rib purist might contend that you should grill or smoke the ribs first and then finish in the oven, but I find the technique below easier for a week night dinner or entertaining with kids. You can do a lot of the work the night or afternoon before and then just it takes just a few minutes to finish the ribs on the grill. 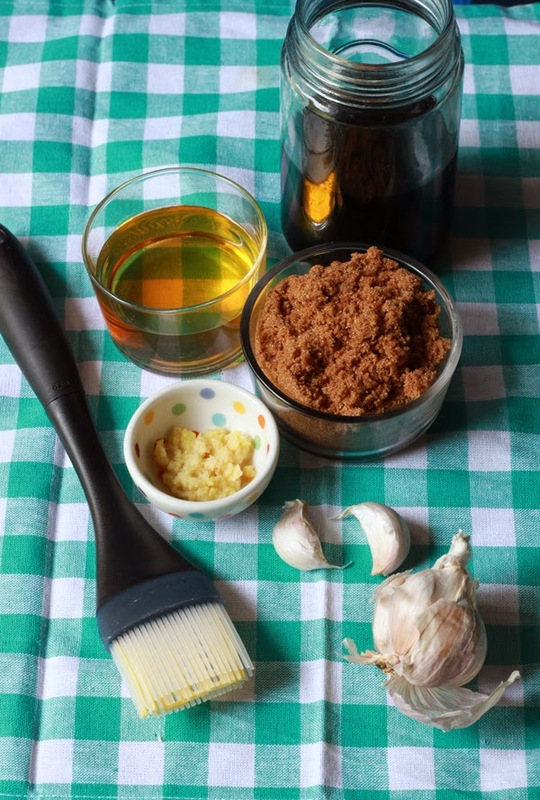 Combine the salt, sugar, garlic powder, and pepper in a small bowl. 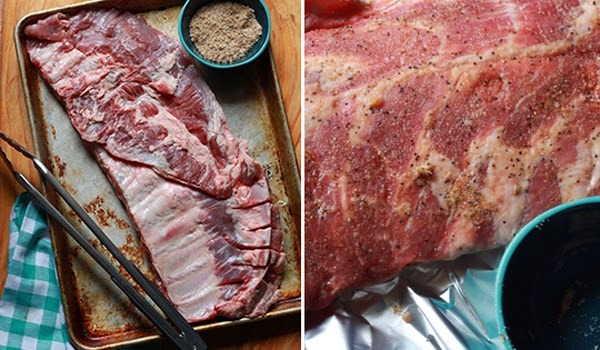 Line a baking sheet with aluminum foil, be sure to leave enough overhang to wrap the ribs. Rub the ribs evenly on both sides with the salt mixture, cover with the aluminum foil, and leave at room temperature for 30 minutes. Heat the oven to 400 degrees F. Roast the ribs for 11/2 to 2 hours or until they are fork tender. While the ribs are cooking prepare the teriyaki sauce. Combine the soy sauce, sugar, vinegar, garlic and ginger in a small sauce pan and bring to a simmer over medium heat. Simmer the sauce for 30 minutes, or until the mixture is reduced by 1/3 and slightly thickened (it will continue to thicken as it cools). Remove from the heat and cool while preparing the grill. Heat a grill to medium high heat. When the ribs are tender, remove from the oven and cool for about 30 minutes before slicing. 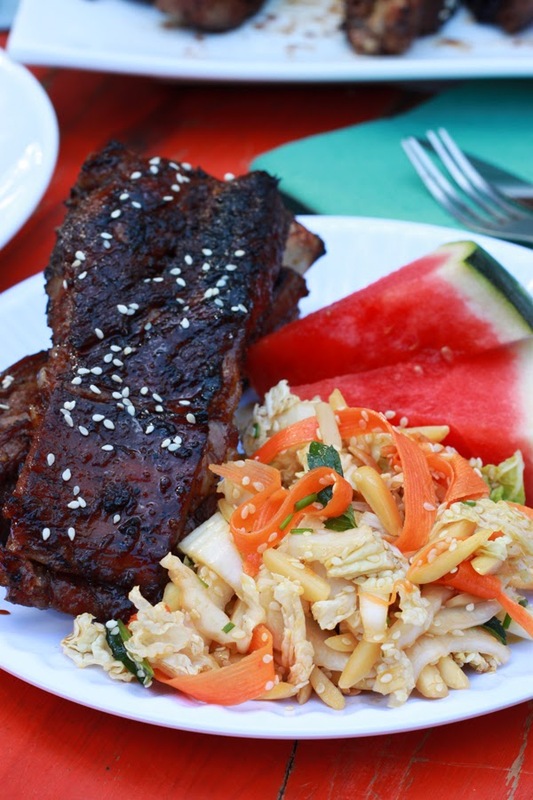 Grill the ribs for 2-3 minutes per side and bast with teriyaki sauce as they cook. 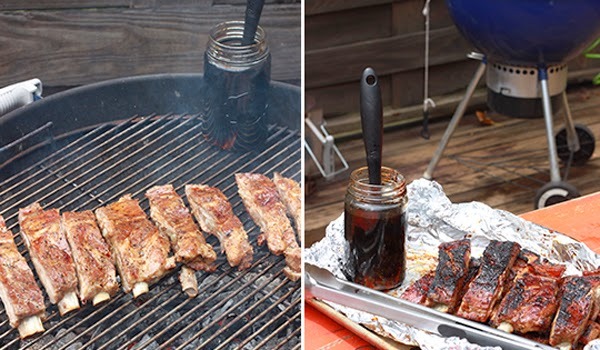 The teriyaki sauce will caramelize on the ribs, so don't be put off by the dark color of the finished ribs. Serve with additional Teriyaki Sauce and sesame seeds, if desired. Both the rib roasting and the sauce making can be done up to two days in advance. Cool the ribs before refrigerating and slice just before grilling - the heat of the grill will be more than enough to reheat the ribs. My friends at OXO sent over this Little Salad Dressing Shaker and I'm kind of obsessed with it. You can measure dressing ingredients right into it and the spout is perfect for dressing this Napa Cabbage Slaw. 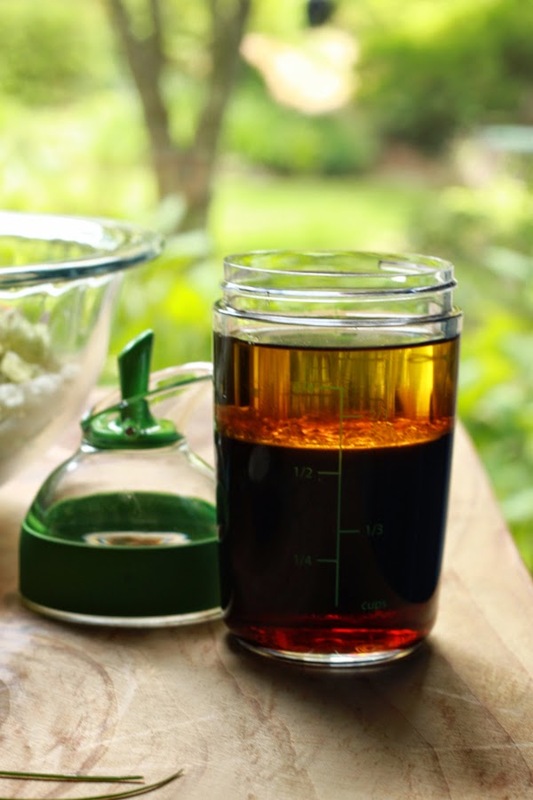 Combine the olive oil, soy sauce, vinegar, maple syrup, sesame oil, and ginger in a small lidded container - such as OXO's Little Salad Dressing Shaker or a canning jar - and shake to combine. Taste and season with additional salt, as desired. 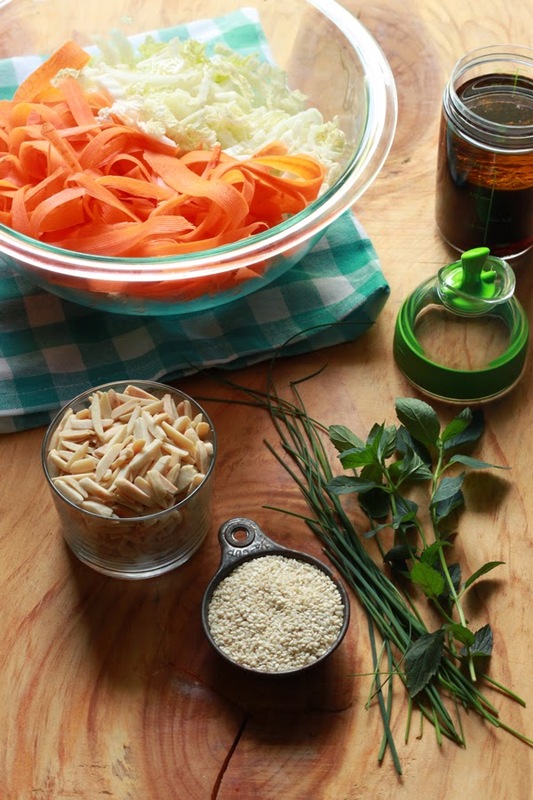 Toss cabbage, carrots, mint, chives, and sesame seeds together in a large bowl. Add about have the dressing, toss, and taste. Let the slaw marinate for about 30 minutes before serving. Add the almonds just before serving. *You can absolutely use store-bought teriyaki sauce for this recipe - you will need at least 1 cup for basting. 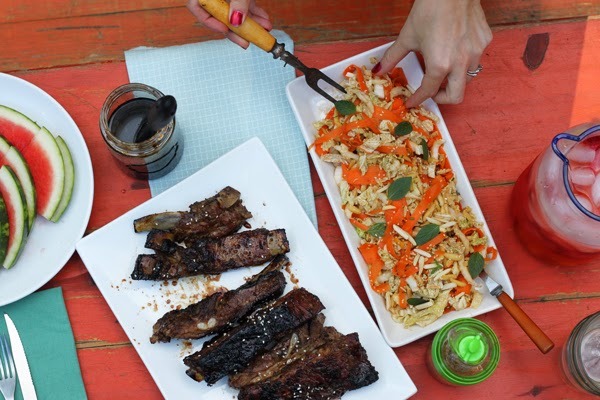 **OXO provided products for this post - including Little Salad Dressing Shaker, the Silicone Basting Brush, the 16" inch tongs (which are killer for the grill BTW). For more on their #What a Grill Wants series be sure to follow OXO on twitter. All opinions are my own.